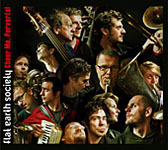 Fifteen-piece Belgian big band Flat Earth Society is the sonic equivalent of a freak showweird, wonderful and like nothing you've come across before. Cheer Me, Perverts! is bursting with the energy of punksharing some of the anarchy, tooyet the CD exhibits intricate section harmonies and wonderful contrapuntal melodies. The soloists revel in their freedom, and the playing is characterized by idiosyncrasy and skill in equal measure. Frank Zappa-esque and Duke Ellingtonian in turn, Balkan brass meets 1970s prog rock, Cheer Me is a stirring concoction, which could be the soundtrack for a Terry Gilliam film about a traveling freak show careering through post-industrial Eastern Europe. Founder Peter Vermeersch leads the band over rocky musical terrain. Pulsating brass rhythms comingle with eerie funfair keyboards on the opener, "Vole Sperm Reverie." Peter Vervloesem's guitar solo has an earthy '70s feel and contrasts nicely with Michel Mast's tenor solo, which squeals and writhes like a pig on the way to a slaughterhouse. Brass buzzes like a swarm of angry bees on "Blind Inside," while on "Rearm, Get That Char!" Luc Van Lieshout's muted trumpet sounds like a brooding Miles Davis, circa On the Corner (Columbia, 1972), meeting the jungle sounds of Duke Ellington's band. "Kotopoulopology" staggers like an inebriated Zorba the Greek (1946), accelerating briefly as though tumbling drunkenly down an incline; when the clarinet enters, it sounds for all the world like a chiding wife. Beefy brass riffs run through many of the compositions, and noirish arrangements build like gathering storm clouds. When the brass section reaches a full head of steam, as on the tremendous "Too Sublime in Sin," the dark power summoned is enough to set free the hounds of hell. There is, however, an obvious subtlety to the music. Bruno Vansina's lyrical flute intro and subsequent solo on "Blind Inside" are gorgeous, and "Too Sublime in Sin" begins with the chamber finesse of the Modern Jazz Quartet, with meditative contributions from accordion, piano and trombone. However, the reverie is shattered by a brass intervention that sounds like a lunatic pounding on his car horn. The song reaches a skull-crushing intensity, with brass chirping and growling over searing guitar before returning to the delicate piano of the intro. Charlie Shavers' "Dawn on the Desert" boasts lush Ellintgton-like brass arrangements, with velvety baritone underpinning flirtatious clarinet. The closing segment of the number recalls "It Had Better Be Tonight" by Henry Mancini. The spirit of Ellington is heard also in Peter Vandenberghe's piano playing and Teun Verbruggen's tremendously impressive drumming, his percussive coloring and hard swing bringing to mind both of Ellington's great drummers, Sonny Greer and Sam Woodyard. 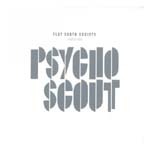 Thumping rhythms and jungle noises sit alongside Zappa-esque circus-motif gaiety and percussive plonks and tweaks. Bebop jazz is not afraid to raise its head, and occasional abstract passages contrast with ensemble playing of real beauty and power. As riotous as it is infectious, this is a strong contender for big band album of the year. Track Listing: Vole Sperm Reverie; Rearm, Get That Char! ; Kotopoulopology; Blind Inside; Bad Linen; Too Sublime in Sin; Dawn on the Desert; Flatology; Smoke on Fire, The King is Burning; Mutt. 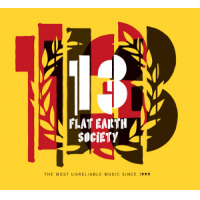 Flat Earth Society CD/LP/Track Review Ian Patterson Crammed Discs United States Zappa Ellington Miles Davis Modern Jazz Quartet Charlie Shavers Henry Mancini Sonny Greer Sam Woodyard Cheer Me, Perverts!